In the UK, the term “Master Mariner” is reserved only for those who hold an unlimited master's certificate. The term “unlimited” (often referred to as unrestricted) indicates that there are no limits on size, power or geographic location on the certificate. It is the highest level of professional qualification amongst mariners and Deck Officers in the British Merchant Navy. 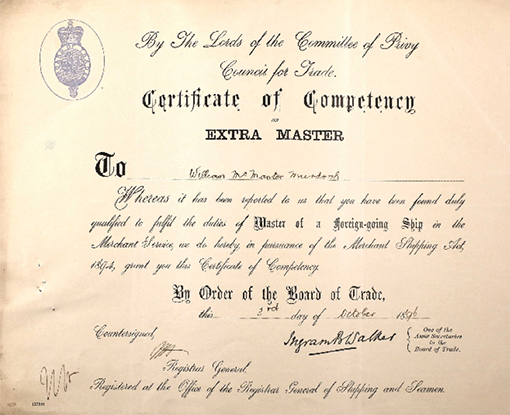 The Extra Master's qualification, which was discontinued in the 1990s, used to be the highest professional qualification and it was the pinnacle for any mariner to achieve. There are also various other levels of Master's certificates, which may be restricted or limited to Home Trade/Near Coastal Voyages and/or by gross tonnage. The holder of a restricted Master's certificate is not referred to as a "Master Mariner". By the time William McMaster Murdoch joined the White Star Line in 1899, the life and duties of a merchant seaman or officer were subject to the so-called Merchant Shipping Act of 1894, coming into operation on January 1st, 1895. It is a vast compendium comprising no less than 750 regulations deploying over 320 pages, amongst 175 paragraphs solely dedicated to Masters & Seamen dealing with their duties and competencies as seafaring individuals. Many of the regulations found herein used to play a vital part in the recurring routine of an officer`s life, especially on foreign-going ships, though they sometimes must have been a dull and time-consuming nuisance. These certificates were granted upon application and examination by Local Marine Boards along with a testimony of the previous service at sea. William McMaster Murdoch successfully passed his examinations for Second Mate in October 1892, and for First Mate in March 1895. These two, in the lingo of the Board of Trade commonly referred to as “Ordinary Competency”, were usually abbreviated “OC”. In October 1896, William Murdoch also achieved the highest qualification possible, the so-called “Extra Master”, or “Extra Competency”, abbreviated “ExC”. Upon passing all these three examinations, a respective “Certificate of Competency” testifying the grade achieved was issued by the Board of Trade in duplicate: The first copy to be handed over to the applicant or officer, the second copy for filing purposes with the Registrar-General of Shipping and Seamen or the Board of Trade itself. Being granted the possession of such a certificate however did not result in a framed picture on a home wall, as these competencies needed to be produced to the master of a ship as well as to the superintendent upon signing the crew assignment for each voyage. Thus, William Murdoch just the same as any other officer within the merchant fleet, was obliged to have his certificate of competency at hand onboard at all times. Which of course was the due case when he joined the R.M.S. Titanic. As such, the first copy of his “ExC” went down with the ship as did many certificates not only with Titanic which were either lost by destruction, deprivation or simply by scattiness. Not even a long-term association with the same shipping line freed an officer from this obligation of proving his competency each and every time he signed on for a voyage. 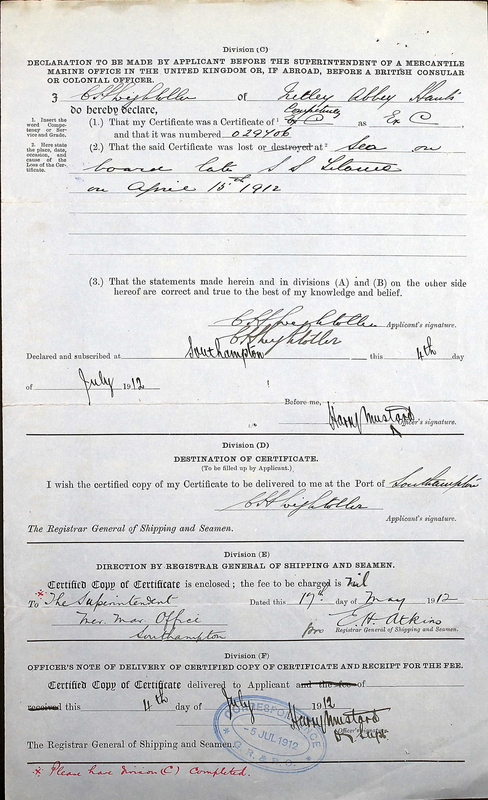 Thus Titanic`s Second Officer Charles Herbert Lightoller for instance was obliged to submit an application for a certified copy of his competency after the loss in July 1912 (see below, pic. (3)), as he also forfeited his first copy on the ill-fated vessel as did his fellow officers Herbert Pitman, Harold Godfrey Lowe and Joseph Groves Boxhall. Only upon the production of all required certificates, the Marine Superintendent in charge or his deputy was allowed to issue an approval to the master in return which was imperative for the chief officer of customs in order to allow the vessel to leave the harbor. However, a valid certificate of competency was by far not the only piece of paper William Murdoch had to deal with when setting out for one of his numerous voyages. Apart from signing the so-called crew assignment, no less than a formal work contract between the White Star Line and the undersigned, in the presence of the superintendent and producing his certificate of competency, there were quite a lot of other formalities which needed to be accomplished before setting out to sea. When taking a closer look at Titanic`s crew assignment, or any other crew assignment from that era, there are several imprints either reading “Dis A produced” or “Dis A not produced” in front of each of the crew member`s signature. pic. (4) – What is a “Dis A”? One of the things quite normal within the Merchant as well as the Royal Navy is their predilection for using abbreviations which mainly refer to standardised form sheets. A slang or code, which even had become second nature to William Murdoch, who being part of the “family” since 1899 got acquainted to use phrases such as “aΙ” even when writing letters to his folks back home. Respectively, the so-called “Dis A” was nothing else than just another form sheet, or certificate, being issued to each and every crew member down from firemen up to mate in form of a neat little service book bearing the official title “The Continuous Certificate of Discharge”. This personal booklet meticulously comprised every single assignment of a seaman or officer along with a continuous report of his conduct, character and qualification while serving onboard a ship. In order to be duly filled in, these “Dis A” booklets where not only to be produced when signing on but to be handed over to the master of a ship for safe keeping and were only returned either at the end of a voyage or, if the seaman or officer failed to join for the voyage, were to be deposited by the superintendent for a fortnight. If the crew assignment was missing a respective entry, that all “Dis A” had been thoroughly produced, British Consulate authorities would have declined their signatures thus immigration to The United States would not have been possible. But even then, after signing the crew assignment, producing his “ExC Certificate of Competency” as well as his “Dis A Continuous Certificate of Discharge”, William Mc Master Murdoch was not yet through with showing off his accounting books. Being promoted to Lieutenant of the Royal Naval Reserve R.N.R. in September 1909, he did not only qualify himself for a higher military rank but was yet granted another form sheet he had to carry along with him when setting foot onto a vessel. This form sheet, or certificate, was named “R V. 02.”, and was similar in style to the “Dis A” as it also represented a personalized little booklet containing rather similar information. While the “Dis A” booklet was solely restricted to the engagements within the Merchant Navy, the “R V. 02. 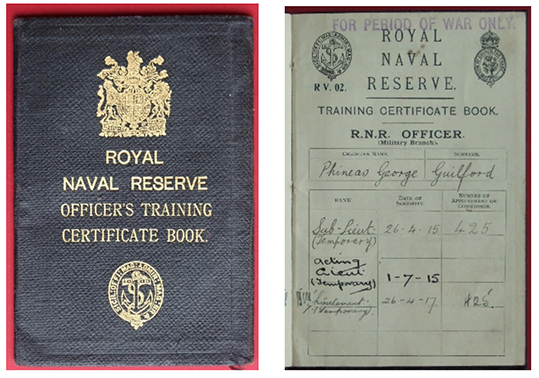 Royal Naval Reserve Officer`s Training Certificate Book” was meant to give testimony on the Royal Naval Reserve training and service the holder of such a booklet usually had to complete in due course. R.N.R. training sessions had to be accomplished annually for a minimum of 2 weeks unless the officer applied for and was successfully granted a so-called “test certificate”. By gaining such a “test certificate”, the officer freed himself from any kind of training in the following year. William McMaster Murdoch achieved such a “test certificate” while undergoing R.N.R. training on July 3rd, 1907, thus he was not obliged to undergo training in 1908. 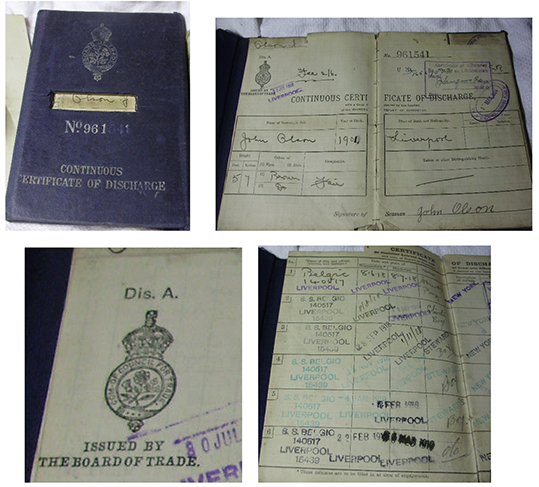 As the above booklet indicates by featuring both the insignia of the Royal Naval Reserve as well as for the Council of Trade, both institutions were closely connected to each other by forwarding or swapping information as to the services and conduct of their officers. Thus, William McMaster Murdoch did not only produce his “R V. 02.” when applying and undergoing military training, but also presented his “Royal Naval Reserve Officer`s Training Certificate Book” to the superintendent when signing on a crew assignment with the White Star Line. The superintendent thereafter would pass the information of a new engagement on to the Registrar-General of Shipping and Seamen who would upon receipt also forward it to the Department of the Accountant-General of the Navy. Thus both institutions, the Board of Trade as well as the Royal Naval Reserve, were ensured to have the same level of information as to the engagements of their officers. While specific information of the Royal Naval Reserve activity found its way into the White Star Line Officer`s Record of Service in Company, the merchant navy engagements were meticulously filed down in the employment section of the Royal Naval Reserve Service Record. But apart from producing a colorful assortment of certificates, signing on for a crew assignment was a good chance for a friendly chat with the Marine Superintendent who would curiously have an eye on all of his officers as well as their progress within the company. After all what is known, William McMaster Murdoch was a highly esteemed officer, ambitious and well-liked amongst his superiors. Hints as to him being on good terms with high-ranking superiors can be found in his letter to his sister Peg (Margaret), where at some point he mentions a private communication with the Head Marine Superintendent from Liverpool (=Charles Alfred Bartlett, his former Captain on the Germanic in 1904) upon his downgrade and who “(..) as much as promised (..) that I am to go up again (..)”. 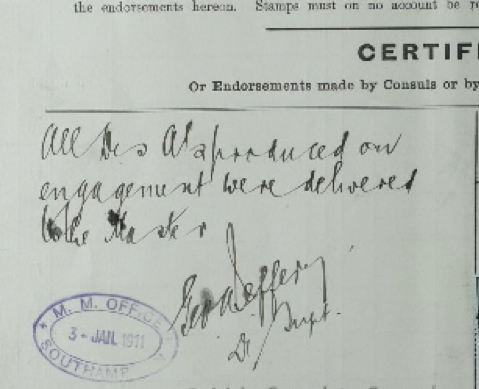 So after having signed on the agreement, producing his various certificates such as “ExC”, “Dis A”, “R V. 02.” and chatting a while good-humouredly with the superintendent, William McMaster Murdoch was finally through with his personal paperwork of proving his abilities and competencies to see about some more heaps of papers and reports which he had to deal with from different sections of the ship as to victualling and recruiting, before the vessel was ready to set out to sea. All his personal certificates however, the ones testifying his remarkable career with the White Star Line as well as with the Royal Naval Reserve, were lost on April 15th, 1912, when Titanic took its final plunge into the Atlantic Ocean.